So that's the news around here. If you have been wondering where am I, I am here, in my house... for more than a week. My husband is helping me with the store and I'm still able to paint (wohooo!). Actually I just finished a few pieces. I can't sit for long periods of time but I managed to make some stuff. I hope you like them! 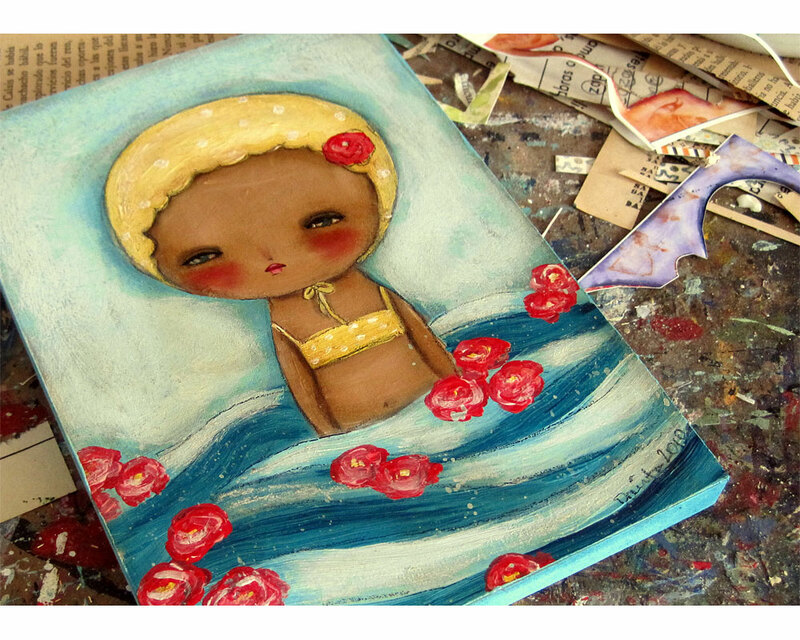 "Rosas en el mar" (Roses in the sea) 5x7 on wood. You can read the lyrics of the sond that inspired this painting here. 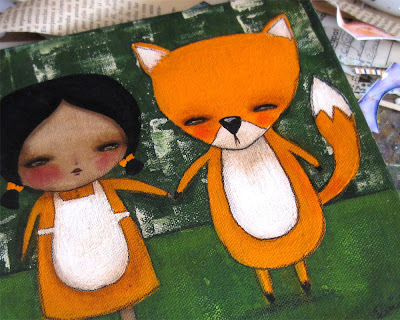 "Me and my fox" 8x8 on stretched canvas. My step daughter just went through a long pregnancy of staying in bed and staying down. She has a healthy little baby boy now! It is worth it. I'm so happy you can still paint! Good to see that you are taking the bed rest seriously. Thankfully, you are able to do your artwork! :) I love "Roses in the Sea' and 'The Baker' They are darling!!! I'm glad you can still create. I love "The 3 of us"! Happy to see you are good spirits, and have been able to paint! 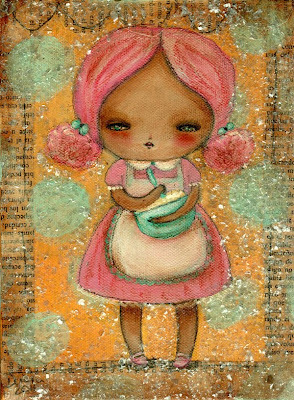 :) Your newest pieces are tooo sweet!! I am dyyyyiiiing over "The Baker"!!! I LOVE it!!! Will she made into prints!! I must have her!! I'll be sending good thoughts your way!! Thanks again for sharing your news. I am due to have a baby in 4 weeks & I have a nearly 2 year old wanting to be lifted, but I can't due the the pressure on my pelvis. It's a challenge at all stages of pregnancy. Thank goodness I agree you can still paint I love to see what you come up with next. Look after yourself. Beautiful Danita! I love "The Baker". I'm also glad you can still paint and share this inspiration with us. Rest and take care of you two! Love the work! Danita, felicidades por el nuevo ser que está dentro de tí. Cuídate mucho y cualquier duda que surja, avisa inmediatamente al doctor. Un abrazo y te tendré en mis oraciones para que los dos estén de lo mejor!!! 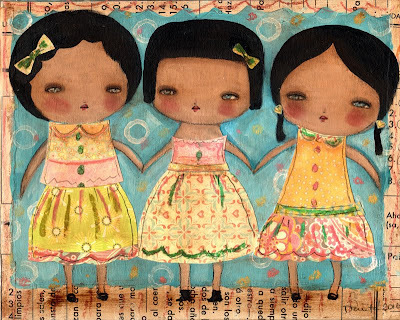 just love them all as usual - the little swimmer is my particular favourite!!!!!! I found you through another site and I have to say I LOVE your artwork, it is beautiful. I just started blogging and a new website, but have a long way to go. I will keep checking yours because I love what you do. 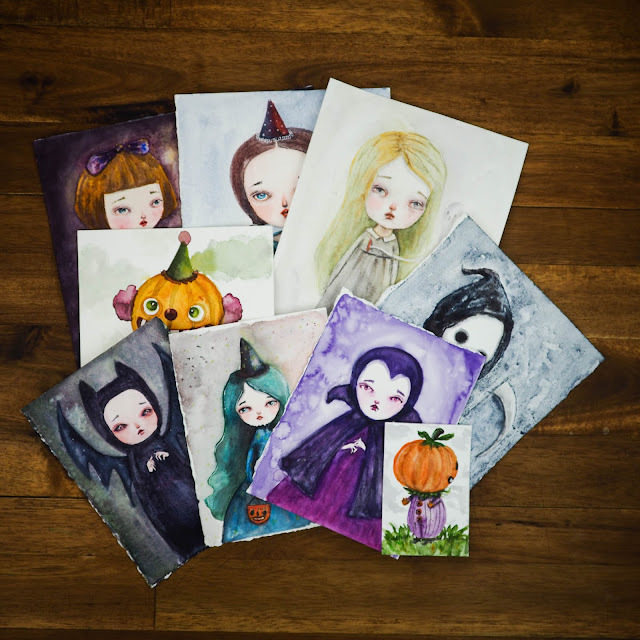 These pieces are so cute !